The Falaise Community Association has had two different logos over the years. Some of our members have suggested that it is time to update our logo again; our current logo is “clip art” and so not truly ours. We have asked for your ideas for a new logo in the past but not had any response. Maybe that means nobody really cares – or maybe it means we need to offer an incentive? So here is the incentive: Design us a new logo. We’ll post all submissions on our website and display them at our neighbourhood picnic in September. Members will then be asked to vote for the one(s) they like best. If there is a clear winner we will adopt that logo and the designer will receive a cheque for $200. We know that designing a logo can be a lot of work, so don’t worry about making it perfect to begin with. If you win, then we will ask that you fine tune it. Please submit your logo designs by September 1st, 2018 to Carl Ross at webmaster@falaise.ca. As promised, the winning entry will receive a cheque for $200. The designer has asked that her winnings be donated to the Maasai Conservation Fund. 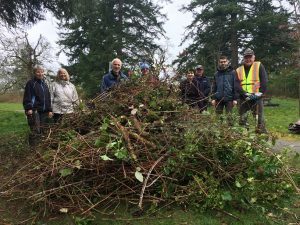 Six volunteers spent a couple of hours on Sunday morning to continue the effort of removing invasive species from the park. These photos give a sense of their accomplishments. 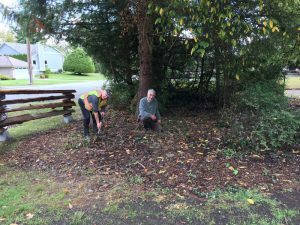 Bob Lucy, President of the FCA, and Stuart Macpherson, Park Steward, weeding ivy and periwinkle shoots from the mulched area opposite the playground. Another swath of periwinkle and ivy removed beside the fence line. The annual summer picnic was held in Falaise Park in the afternoon of September 9th. 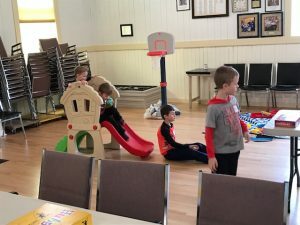 Although the weather was not perfect, with showers on and off, a total of 57 adults and 17 children attended the event. Guests enjoyed a wide selection of food, including barbecued hot dogs with fried onions, samosas, various wraps, chips, squares and cookies. A clown, The Great Odini, entertained the children with juggling, twisting balloons and magic. Bob Lucy’s beehive with glass windows was a hit with both kids and adults. Mayor Atwell, who lives in the Falaise community, welcomed everyone to the picnic. Thrifty Foods (Broadmead) provided a generous gift certificate and loaned us a tent that helped keep everyone dry. Several volunteers were crucial to the success of the event. 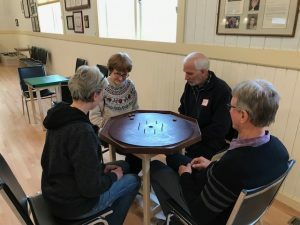 Stew Vinnels provided several tables; Chris Nelson transported Mac Nanton’s barbeque to and from the event; Kyla Shauer’s family helped with serving the food and taking photos. Meetings were held in June, 2018 to vote on the new constitution. The membership approved the constitution, subject to one amendment and the correction of some typographical errors. The final version is now registered with the BC government. We have prepared a document that gives an overview of why the constitution needed to be changed and the key differences between the old and new. We have also annotated the existing constitution to show in more detail how the two documents differ. The Start of Summer Party and Special General Meeting was held at 7:15 pm on June 13, 2018 in Kyla Shauer’s back yard. 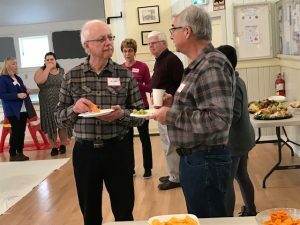 Twenty three Association members attended and enjoyed an extensive selection of treats, including vegetables, fruits, cookies, cheese, crackers, potato chips and lemonade. The objective of the special meeting was to vote on the new constitution for the FCA. Unfortunately, the number attending did not constitute a quorum so no vote could be held. After the official meeting was adjourned, Stuart gave a presentation on the work being done to control invasive species in Falaise Park and Mac discussed the development of 855 Falaise Cres. The FCA constitution stipulates that when a quorum isn’t present at a general meeting, the meeting can be convened one week later at which a quorum is defined as the number of members present. The second meeting was held on June 20 at 7:15 pm in Kyla’s back yard. This time, eighteen members attended. The existing constitution required that at least 75% of those present, or 14 members, must vote in favour for the constitution to be adopted. Two versions of the constitution were drafted: one in which membership is restricted to residents only; and a second in which businesses could also be members. Mac introduced a motion that the new constitution, with membership restricted to residents only, be adopted. The floor was then opened to discussion and an amendment was proposed that required a clearer definition of the region represented by the FCA. Furthermore, it was agreed that various typographical issues be corrected. The amended motion passed, with sixteen members voting in favour and two abstentions. 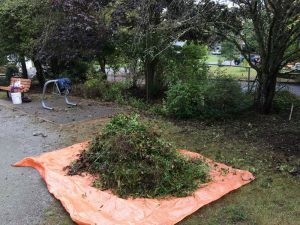 A group of four hard working volunteers continued clearing the invasive ground cover near the playground. Some very large blackberry root stubs were excavated. More invasive (and poisonous) Daphne plants were discovered and pulled from along the fence line. Such a small group accomplished a lot. Another work party was completed at Falaise Park on May 31. Five enthusiastic volunteers showed up to continue pulling out invasive plants in the park. 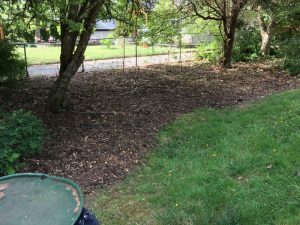 A mat of English ivy and periwinkle was removed along the side fence and a start was made in spreading compost mulch on the cleared area. The area is scheduled to be planted with native species this fall. Also a start was made in digging out blackberry by roots along the topside of the play ground. 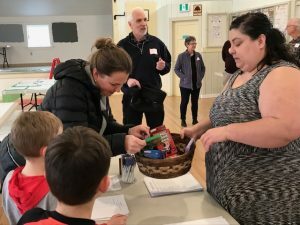 Several residents from the Falaise, Broadmead and Royal Oak communities attended a presentation by Fair Vote Canada on Sunday afternoon. McCall Gardens made their meeting room available for the event and assisted with the PowerPoint presentation. 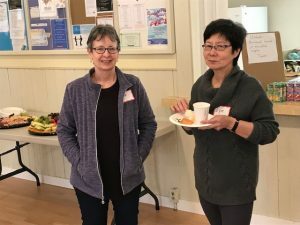 The objective of the meeting was to help residents decide on how to vote on the referendum that will be held this fall. 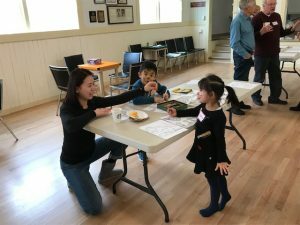 The pros and cons of various voting systems were discussed and it was pointed out that most democracies now use some form of proportional representation. Approximately fifteen residents of the Falaise community participated in the annual garage sale on Saturday morning. Participants who contacted our director, Kyla Shauer, had the location of their house noted on a map that was part of the advertising literature. An unofficial survey about half way through the event indicated that most houses had several visitors stopping by. A lemonade stand was set up near Falaise Park to take advantage of the extra traffic on the crescent. 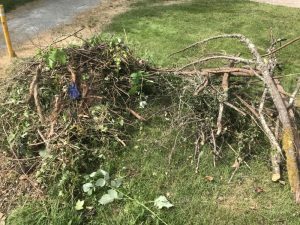 A work party was held on March 29th to begin the process of pulling out the invasive plants that have been slowly taking over and displacing the native vegetation of Falaise Park. 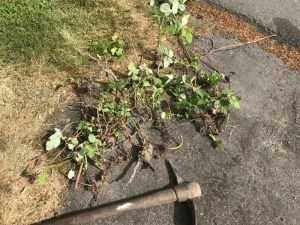 A crew of seven keen volunteers showed up and a good start was made in clearing away the blackberry bushes and English ivy near the playground. 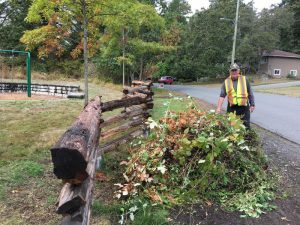 The work is being carried out under the auspices of Saanich Parks volunteer Pulling Together Program. Parks has appointed local resident and FCA director, Stuart Macpherson, as the volunteer Park Steward. Stuart has prepared a Park Restoration Plan with the objective of stopping the spread of invasive plants and restoring the Park’s vegetation to its natural state as a Garry Oak meadow ecosystem. Planting of native trees and shrubs is to follow as the invasive species are removed.